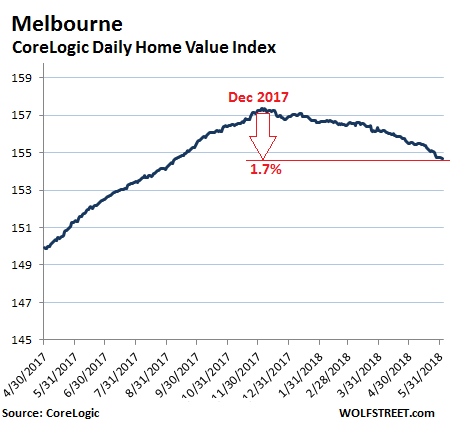 Melbourne has taken over from Sydney as the weakest housing market, recording a 0.5% fall in values over the month to be 1.2% lower over the three months ending May. This is the largest decline in Melbourne dwelling values over a three month period since February 2012. Melbourne’s housing market was previously looking more resilient to value falls relative to Sydney. Recently however, auction clearance rates have been deteriorating, inventory levels are rising, and transaction activity is tracking 12.9% lower than one year ago. For the other three of the five capital cities, the situation is mixed. In Brisbane, home prices ticked up 1.2% from a year ago. In Adelaide, home prices edged up 0.6% from a year ago, so essentially flat. 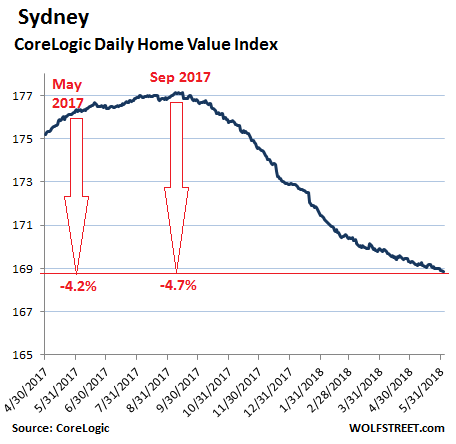 Corelogic suggests that house prices have fallen 2.2% thus far in Sydney since the beginning of this year. However, in-the-field research is telling me that house prices in Sydney have fallen significantly faster than this figure. While it’s hard to pinpoint a completely accurate figure, I would say somewhere closer to an accelerating 5%-7% is more in-line with what we are seeing on the ground, with a total 7%-9% fall since the market peaked last year. There were 670 homes scheduled for auction on the weekend. But only 336 of the auction results were “reported” by June 2. Of those 336 “reported” results, 238 homes sold either before the auction or at auction. And 91 homes were “withdrawn.” The all-important “auction clearance rate” is figured by the sum of all homes sold at auction and before auction, divided by the sum of all “reported” auctions and all homes withdrawn. This produced an auction clearance rate for the weekend of 56%, the lowest since February 2013! From 2013 through 2016, clearance rates in Sydney had mostly been in the 70% to 80% range. Last year, they began to deteriorate, and late last year fell below 60%, something that happened only a couple of times since 2012, including once in February 2013. Clearance rates for Melbourne have also started to dip below 60% recently, something that hasn’t happened since 2014. For this weekend, they were 60%. These dismal auction clearing rates were the consequence of an “upsurge in fussy buyers,” according to Domain. Where I live in North San Diego County homes are selling less than a week on the market. Top dollar and looks like the smart ones are getting out . Two new listings in my neighborhood this morning. The new housing in the incorporated areas is mostly high density while a remote mountain top in the Temecula area might be already parceled out with an HOA. There is a new proposal to further limit back country development in SD, and the board of supervisors looks ready for a change. Will a new board open things up? Increasingly its hard to find more freeway space to accommodate the expansion. The voters rejected a new airport, where it means more homes, more freeway congestion, more drain on infrastructure, and higher taxes. The upcoming permanent water rationing should work wonders for property values. Because California doesn’t have enough regulation. Sarcasm alert. Yes. Two years of seeing the Kings River (a few miles north of my abode) bone dry year round convinced this sample of one that the state’s water supply is best left to self-regulation-by-market-forces. In a state with so many people and an uncertain water supply, a government that didn’t regulate the supply would be negligent, to say the least of it. Old California saying: “whiskey is for drinking, water is for fighting.” I’m tired of people missing about regulations – yes, some are burdensome, but many are necessary. Unless one wants to see people dying of thirst next to well-watered golf courses, or replay scenes from Dune, we can either regulate scarce resources, or watch people fight pitched battles for them. Don’t forget the variances for those with swimming pools and other “special allowances” for ”local circumstances”- regulations are awesome. I keep my sparkling pool, spa and landscaped yard, and you will be fine doing your laundry on B days. Right? Just properly price water and third problem goes away. Look at the prices farmers pay for water – it’s criminal, absolutely criminal, how little farmers pay for water. If farmers paid market rates for water there would be plenty of water fort urban use. Something like 90% of water is used by agriculture and they pay next to nothing for the privilege. Just put up the price farmers pay for water by 10,000% – ie – just stop these massive market distortions of subsidised water prices farmers get away with – and there will be no problems with water shortages in California. BTW, farmers don’t use treated tap water. The use untreated river water and/or groundwater. Many of them have water rights and pump their own water. So charging farmers for this water is going to be tough. Good regulation is best (treating groundwater and river water as a common good). But this is lacking in California due to the old system of water rights that stay with the property and determine the value of the property. On the other hand, Texas has pretty decent and functional regulation of water usage by farmers. It might be interesting to check out smaller cities that are experiencing their own amazing transformations into mini boomtowns. I spent 2 weeks in May in Portland, Maine (lived there as a school kid) and found prices approaching what I had left behind in Seattle with a comparable (for it’s size) construction boom. The lament from the locals was the same as the working class locals in Seattle. Who are paying these prices and where is the money coming from? I have no idea.. This seems to be a worldwide phenomenon so it seems to me if this pops in one place it will pop everywhere. In Seattle its not hard to see where the money is coming from. The house I’m living in is owned by a Chinese landlord, who owns several other properties. The house next door was purchased last year by a person from China who is employed by one of the tech companies in town. So there’s a clear China element to it. Plus there are jobs. Just about everyone who purchases in my neighborhood works for a tech company. They are paying $600 per square foot lately. I wouldn’t call any of them particularly thoughtful. It’s very simple – they get a job and have a family, so they want a house. Anyone in tech knows where the money is coming from. Microsoft, Amazon and others are riding high. Google and Facebook are expanding here. If tech ever has a recession, Seattle will be hit hard. Until then, the party continues. It’s good to see Australia finally settling down. As a renter, it’s nice to know the price increases have a limit, somewhere. So Chinese money moved to US. Sydney and Melbourne price growth was mainly driven by Chinese hot money that almost dried up in the last 6 months. All of these asset bubbles worldwide have the same causative factor: deranged money-printing by the Keynesian fraudsters at the central banks and resultant hot money flows to oligarchs and grifters worldwide. We will not have honest markets or sound money until we end the Fed. Meanwhile in Canada, the Canadian mortgage growth rate is the slowest its been since 2001, while the home owners continue to treat their houses as ATM’s, with home equity cash outs growing. The three big real estate markets led by the Toronto area, have experienced a price topping and a rolling over of values. This has the earmarks of being a slow-motion train wreck, versus the 08 wide spread and sudden sub-prime collapse. Or not. Sudden price rises and collapsing markets are very local phenomena. When I read the article, I (like most readers), compared the 80% 10 year rise to my own and extended family’s experience. In Campbell River BC, I sold my house in 2006 after it had increased in value by 110% in 5 years. (softwood tariff effect caused the initial drop). Fast forward to today and recent escalating rates. The same house over the last 10 years has increased between 30-40%, despite the big ballyhoo of peak debts. When I relocated to a rural setting in 2006, I put some of my windfall into term deposits for 1 year so I would not make any rush purchases/mistakes. An aquaintance of mine one day came to visit and offered me his 15 acres zoned residential (the only large residential property in the valley, everything else stuck in the ag land reserve), for his assessed tax value, $200,000. It was across the street! I immediatedly agreed, used some interim financing until term maturity, and listened to the oldtimers snigger about how stupid we were. (You know the refrain, they come over and look around at my renovated house and tell us how they could have bought this for ______ back in ________, but they didn’t). We grow potatoes on it, fruit trees, pond, a woodlot, with one small rental. I haven’t a clue what it’s worth these days, but know it has more than doubled. I don’t hear anymore sniggers. The point is that there is a time to move on, depending on what station in life a person is at. My nephew in SF bought a rancher in Novato for $750,000 some years ago. I thought he was nuts. He hates his job, hates his commute, and now feels stuck; growing older by the day. I mentioned to his mom it might be a good time to sell and relocate. He could probably pay off the mortgage and walk away with a million. Many many fine places he could now move to, pay cash for a wonderful home, and work part-time. His wife could substitute teach. He won’t jump off the wheel and suspect he will see the great decline, right where he sits. I believe most of the high priced cities have already passed their best sell date. I glanced at the Market numbers and was surprised they have not started tanking today. Yet. There is a trade war ramping up. There is a bogus North Korea meet and greet with inevitable failure looming. Maybe war. Energy costs are increasing and conventional oil is in decline. Debt is at an alarming level and most things look unstable. Surely, this is the time to jump, duck, and cover. This deflation is already hurting tax revenues in the (australian) states of New South Wales (think: Sydney) and Victoria (think: Melbourne). 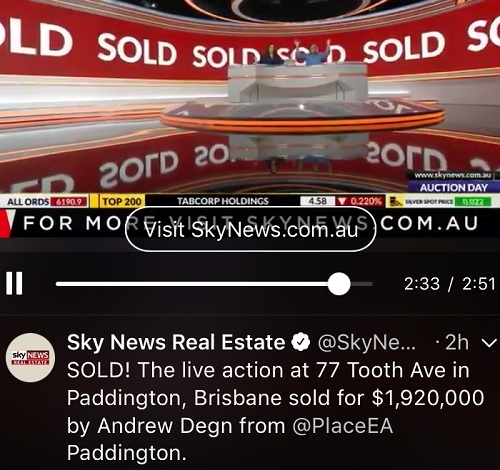 When someone in Australia buys a house/dwelling then that person also has to pay a socalled “Stamp Duty” tax (a % of the selling/buying price). – After the year 2008 the revenues of this tax rose every year. But in april of this year the Treasuries of both states have warned their (state) governments that the revenues of this tax have begun to shrink. It’s a combination of falling volume and falling prices. – Clearing rates in Melbourne already have fallen into the 40s. Sadly unless you are retired or work mostly online, you just have to pick a place close to work. That said, is it a good idea for those renting to keep doing so until prices for buying go lower? Or we might see surprise jumps in prices? There’s a definite ponzi at work in the big cities. People have to live close to work as you say, so the employees reluctantly pay the high prices for housing. Normally, this would increase living costs for employees and ultimately increase wage costs for the employer, which causes an employer to move jobs to lower cost areas or cut back employment altogether. Today, however, employers aren’t having to bear this cost because their stocks keep rising (which compensates employees with stock grants) and employees are awarded with ever-increasing housing values. Thus, employees are being compensated through two unsustainable mechanisms – increasing stock prices and increasing housing prices. When these things reverse, you’ll see compensation plummet in these tech areas and demand for housing will drop like a rock. This is the reason housing in places like San Francisco has reached such dizzying heights. When employers can no longer compensate through rising stock and housing prices, potential employees are much less attracted to these areas. Arguably, the stock market and RE markets in big cities are showing topping signs now. So I would say renting is a good bet unless you want dive into a 30-year mortgage and remain in your new house forever, with no fear of job loss, divorce, etc. Unfortunately, the other option is to put only 3% down if you qualify and let taxpayers take the risk on your home purchase, in the event prices drop and you feel like walking away from the problem. Government is begging to absorb the loss for you. Those currently in power (Republicans AND Democrats) obviously don’t care about the long-term fiscal health of the government or moral hazard issues. All of them need to be removed from office. Unfortunately the answer is “it depends”. Simple thought experiment with round numbers, based on Eastside Seattle. Woodinville middle-high end home rounds to $1,000,000. A 25% fall over four years is a $250,000 capital loss marked to market, not counting taxes, insurance, maintenance, interest, and closing costs. Renting for 4 years is $4,000 a month * 12 * 4 = $192,000 in expenses, with no chance to get them back. Of course, if renting you could have been investing your unused downpayment but I’m ignoring that for simplicity. So, if you believe this is the exact top, that we will have another 20%+ decline over four years, and that you will be forced to sell at the trough, renting and waiting may well be a better option. Other than that, buying will likely still be better over 10+ years. People who buy now will just need to lower their expectations for future appreciation. Disclaimer: We could buy here in Eastside but are choosing to rent. We assume this summer is the peak and we do not want to compete in the insanity of the current market. Renting is not a bad option, especially if you are not sure about putting down 10+ year roots in a specific area. The part missing in your calculation is that on $1,000,000 property most of your mortgage payment is going on the interest. You would be spending roughly $3k on the interest payment, which is just as dead money as renting – unless house prices are rising faster than inflation. All the house price has to do is to up enough to offset what you’d be paying in rent and other carrying costs for the buyer. If you spend $36,000 in rent you have nothing at the end of the year. if you buy and your interest payments and carrying costs are the same all the house has to do is go up in value by $1 and you are better off. Lee: And what happens when the house price drops like a rock and you are in the hole for 50%? Lee that’s not true if the house goes up by $1 but the rise in inflation is greater you are not better off. In Australia, property is not classed as an investment. A cynical mind will see that this is so the industry doesn’t have to comply with any reporting criteria. As a result, agents just leave a lot of the bad news off the books especially for the auction results that they voluntarily turn over to the statistics bureau. The statistics are so juked that you’re better off using your eyes. And here in Perth, it’s bad. Not incredibly bad, yet. Moms and pops are still clinging on as the interest rates are still low but if they tick up even 0.5% there’ll be trouble. So the Reserve Bank of Australia (RBA) is frozen at the wheel. They may not lift rates but international forces will. I’d be shocked if mom and pop are forced to sell to sharks yet again! Wishful thinking, greed and conceit are the main ingredients mixed with Central Bank Monopoly money. When the music stops nobody has a chair or house . The local aristocracy, now, that is a different tale all together. Bingo. And, it will not stop until it all comes tumbling down, otherwise you would not have written that. And don’t forget the new “CASH LAWS” crossing any ditch. Australia and New Zealand have $10,000 limit laws. I know of three examples in just the last two months where the “where did you get this money” nearly killed 3 real estate deals. One was Australia to New Zealand. one was Australian to Panama (by a diplomat no less), one was US to New Zealand (ex-Obama WH guy). Law enforcement stopped payment and nearly killed all three of these deals. The excuse…must be drug money, PROVE the source. All three took over 6 weeks to clear. A friend in New Zealand builds high end condos, pretty much sold out to Americans arriving with cash. Now, these are the 1% or 0.1% folks who believe the train is about to jump the tracks, and looking for safety, and they do things on THEIR own terms.. So, one day we have a headline story the real estate market is exploding higher, and the next it isn’t. You really want to know where the future is? Start listening to the songs the millennium’s are listening to…”I don’t know what I want, and I don’t know if I want it”, ” cut themselves and wait for the feedback”. They do not sign about marriage, homes, or family. Indeed, the whole world is on a fast track of greed, and pretending to fix crappy opioid contaminated water, polluted toxic air, oceans full of plastic that may never degrade, questionable food sources, social civil war, injustice….and on and on. Yep, sure makes a fellow want to become a debt slave and be anchored to one spot. As I’ve posted on other articles, where we are in Melbourne, the RE market is doing fine, thank you. Auctions are hardly used for properties here as most don’t sell anyway. I’d guess only half that go the auction route sell at auction. Then they get put on the market and get sold through a private sale – the normal way for most houses around here. Mostly higher priced houses ($2 million or so plus) or something unique about them go the auction route. I just checked the real estate site for houses for sale in our suburb. Still only one house for sale within 1 kilometer of where I live. The suburb only has 149 houses for sale now and of those 29 are not yet even built. Only a couple of auctions scheduled for the next couple of weeks. The rest are all private sales. Most of the houses currently for sale are in the areas far away from the center of the suburb (the village area) where the higher priced houses are. These outer areas are less desirable and are usually smaller, on small lots, and are priced at about half of what a house in or near the village would get. What is unusual is the lack of properties in the $1 to $5 million range right now. A huge number of those type of properties sold in the last couple of years. The other house that sold had 3/4 of an acre and the house was basically an original – built around 100 years ago or so. The price was around $A2.5 million a couple of years ago. Prices for houses here are really quite simple to figure out. Just take the number of square meters of land and multiply by a figure based on how far you are from the village. If your house is a knockdown or ordinary and in the village area the price is about A$1100 – $1200 a square meter times the area. If the house is new and has nifty appliances or has some unique feature then the price per square meter is higher. The further you go away from the village the cheaper the property becomes. Townhouses are priced differently and the high quality, new builds are actually priced much higher than houses on a square meter basis – hence the trend to buy, knockdown, and build townhouses. (And as for Sydney – prices there have always been ridiculous. Here are examples of two sales last week. The house has the price on it – A$4.83 million. The apartment sold for A$500,000 – ridiculous. That was the cheapest property sold in Sydney last week! I heard versions of this innumerable times in 2007 and 2008 in San Francisco. And Wolf…lets not forget the late 1980’s , Four unit apartment buildings around Union and Larken selling for under 100,000, when a year before it was a bidding war. And if they do so what? I’m not moving for the foreseeable future. I like it where I am and once we get to old to take care of the house we’ll have to move. Where we move then will be dictated by our health and prices of appropriate properties. Too far off to even contemplate. Until then if the price continues to go up – good. If it goes down – so what. If I did sell I’d have to either buy or rent. Why would I buy again if the prices are ‘too high’? Buying and selling would cost at least $A100,000. That’s a huge amount of money to fork out just to try and avoid a price fall that may or may not ever happen or if it does, may be more than the fall in the value of the property. Why would I want to rent? Putting up with a landlord, all the paperwork, and costs of moving? Living in a rental house would be more expensive too. I have my mature fruit trees and nice vegetable garden. Solar panels and solar hot water as well. Throwing away at least A$20,000 a year in rent plus costs of selling and moving while waiting for the ‘price fall’ that may or may not happen is a big gamble. The ONLY reason I’d sell (until I get too old) if is we would ever move back to Japan and as I have posted that is not a reasonable proposition given the numerous changes to pension and taxes in both Australia and Japan along with costs of medical care as you get older. Lee, I totally get that. That’s why most people ride out even a major housing downturn just fine. In the 80s and early 90s, I sat through a 30% decline in the value of my condo and never knew the difference. I loved the place and didn’t need to sell. The problems only arise at the margins (when that’s 10% of all mortgages, you have a massive US-style mortgage crisis) — or when you have to sell. RE is a local market. There will be locations where prices are going up or staying the same even when prices crash in other areas. The point is that some areas may correct and others won’t. It is not all doom and gloom. Sydney is not Australia and has little impact on the entire suburb where I live. I’d prefer prices stay about the same or just go up a little each year – 1 or 2% would be fine from the standpoint of RE taxes. Prices going up just make those more costly. Furthermore, houses are not stocks. Each house that gets sold is unique and different. Patterns also affect the stats. We had a huge number of really expensive houses come on the market over the past few years in our area that skewed the data and made it look like prices were soaring. Ordinary houses went up a little, but not as much as shown by the skewed data. Now that those houses have been sold, there will be a lull in the market until the next buying binge for those type of houses happens and they come on the market. 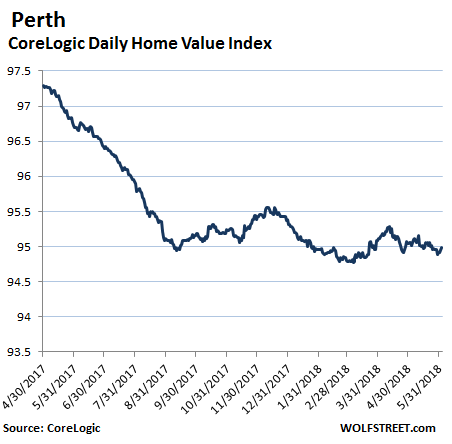 The lower priced ‘crap’ will sell and bring down the price data with an occasional multi-million dollar property selling. Did/will the market ‘crash’? Nope. Has my house fallen in value? Nope. In a year or two the next big apartment/townhouse developments around here will finish and be ‘officially’ sold. Those multi-million dollar properties will again skew the data. For most people that data means nothing. Lee, why would you post these extremely lengthy comments if you don’t care? All that effort and posting all kind of data means you care to the extreme if the house prices go down or not. What I care about is accurate information. Go back a couple of years and the pundits were calling ‘Wolf” on the old ‘Pit’ articles: Australian RE is going to crash, the sky is falling, the economy and banks are going to fall apart in the next few months…………….. It didn’t happen then and it hasn’t happened yet. Been waiting over 20 years for that. 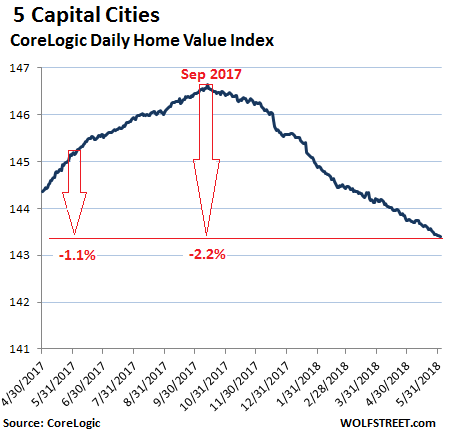 Just like in japan when they had the bubble: it didn’t matter to most people if the price of their house went up or down. They didn’t get rich off of it and they didn’t get poor either. And by the way the RBA left rates unchanged at 1.5% again with the next increase expected sometime next year………….maybe. When I read a comment that sounds like a real estate commercial, I certainly know not to trust anything that commenter says. I also remember the commenter from then on. Wolf, do you have any numbers for (or links to charts illustrating) the Oz bubble(s) since, say around 2000, or whenever the Great Run-Up can be reliably dated as having begun? It would be really nice to have a synoptic snapshot to get a better sense as to how far RE prices have to fall to get back anywhere near long-term price/income levels. Thanks, and as always thanks for your various bubble-tracking articles! IIRC the median income in Australia has more than doubled in Australia in the past 20 years. It is now much higher than in Japan. And thanks for putting up the chart of Sydney to show how ridiculous prices are there. Sydney prices have always been much higher than any other place in Australia. It is the New York or San Francisco of Australia. We still have lots of people moving from Sydney to Melbourne because our RE is cheaper – much cheaper. Several factors have contributed to the housing market decline in Australia. The Banking Regulator has placed limits on investor only loans, limits on interest only loans, increases in State costs for overseas buyers and the four major banks in Australia have had to put aside more cash to cover defaults. The Commonwealth Bank, Australia’s largest has just negotiated to pay a fine of $A700M to one Government agency for failing to report suspicious cash transactions. On top of this is the cost of living, with household energy prices more than doubled in 10 years and no real rise in wages. All the little ingredients have combined to see a decline in home prices. Corelogic, Zillow, CREA, NAR, etc., etc. are all there to prop up the real estate market, not give you and I real information. If the market is flat, they would say it is growing 7% YoY; if it is falling by 10%, they say it’s falling by 1%. I never trust their numbers.